You've heard it before: the more things change the more they stay the same. 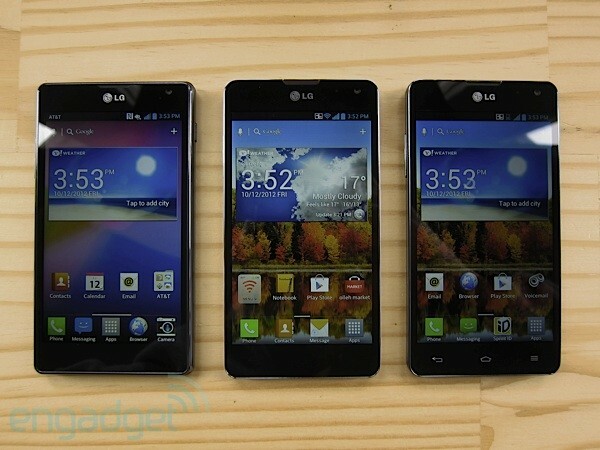 It wasn't that long ago that we reviewed LG's flagship Optimus 4X HD, the world's first quad-core HSPA+ handset. Despite representing the company's best engineering and design effort to date, it wasn't quite able to match the competition's global offerings -- Samsung's mighty Galaxy S III and HTC's lovely One X. Today, just a few months later, quad-core LTE superphones are the state of the art. 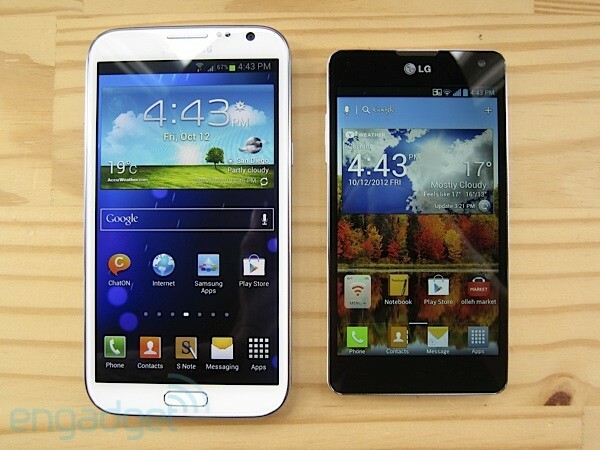 Samsung's selling the global Galaxy Note II, HTC's just announced the One X+ and LG's betting everything on the Optimus G -- the first handset to feature Qualcomm's Snapdragon S4 Pro together with an LTE radio. The Optimus G is a pivotal device for the Korean manufacturer, especially in the US, where rival Samsung is massively popular and LG's success has been hampered by a series of forgettable products (hello, Intuition) and a lackluster track record for software updates. It's so critical that LG even invited us to spend some quality time with the Optimus G at the launch event in Seoul last month. In the US, LG's partnering with Sprint and AT&T and there's strong evidence that Google's upcoming Nexus will be based on the Optimus G. So, does the company's latest powerhouse measure up to the competition? How different are the US versions from the Korean model? 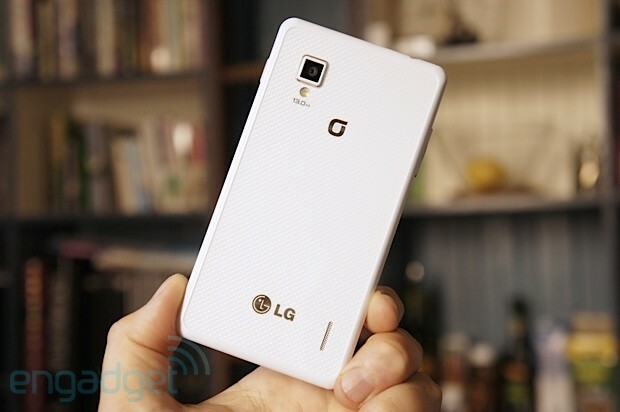 Does LG finally have a winning formula with the Optimus G? Find out in our review after the break. The Optimus G is a phenomenal piece of hardware that combines refined design with superb build quality and provides gobs of performance without sacrificing battery life. How would you rate the Optimus G? Sprint's Optimus G inherits the design, performance and 13 MP camera of its Korean sibling and keeps carrier customization to a minimum. AT&T s Optimus G inherits the performance of its Korean sibling but suffers from excessive carrier customization, including a downgraded 8 MP camera. LG provided us with three Optimus G review units: an unlocked white handset with the 13-megapixel camera for Korea's Olleh LTE network, Sprint's almost identical black version and AT&T's bespoke model with the 8-megapixel shooter. Unlike Samsung's curved, pebble-like, "inspired by nature" theme, the Optimus G inherits LG's chiseled, angular, slab-like design language. The details are more subtle than with the Optimus 4X HD -- it's more of a simple and elegant tribute to past Chocolate and Prada phones. While Sprint's version shares the same appearance and dimensions as the Korean model (the reference, if you will), AT&T's handset is 2.8mm (0.11 inches) wider and 1mm (0.04 inches) shorter. Thickness is uniform at 8.45mm (0.33 inches) and weight varies between 145g (5.11oz) and 147g (5.19oz). Regardless of which Optimus G you handle, build quality is superb -- it's like holding on to a solid block of technology. AT&T's phone feels slightly too wide, but the other two are extremely comfortable in hand, thanks to subtly curved edges where the sides meet the back. Regardless of which Optimus G you handle, build quality is superb -- it's like holding on to a solid block of technology. In front, all three devices feature a beautiful 4.7-inch True HD IPS PLUS panel fitted under an edge-to-edge sheet of Gorilla Glass 2. The earpiece is flanked by sensors on the left and a 1.3-megapixel camera on the right. The Sprint and Korean versions also include an RGB notification light next to the earpiece (it's been relocated to the power / lock key on AT&T's model). You'll find three capacitive buttons below the screen (Back, Home and Menu) which are only visible when backlit. Interestingly, the bezel surrounding the display is black even on the white Korean model. There's no branding in front other than LG's silver logo up top and centered. Around the back, the Optimus G is covered by another sheet of what appears to be glass incorporating a pattern that's only visible at certain angles. This glossy finish, which LG calls "Crystal Reflection", is a veritable fingerprint magnet, especially on the black versions (Sprint and AT&T). It's interrupted only by the camera lens above the single LED flash in the top-left and a vertical slit hiding the mono speaker in the bottom-right. LG's silver logo returns along with carrier branding, except on Sprint's unit which is pleasantly free of network labels. There's no way to remove the back cover -- the Optimus G's sealed 2,100mAh Li-polymer battery is rated for 800 charge cycles (vs. the usual 400-600). The most obvious difference between the three handsets is also our biggest design gripe. The Optimus G is available with either a choice of 8-megapixel or 13-megapixel shooters. Sprint follows the same recipe as the Korean model with the 13 MP camera sensor mounted in a protruding square pod and the LED flash embedded in the back. On AT&T's version, it's the reverse: the 8 MP module is located under the glass surface and the LED flash is recessed in its own divot. This inconsistency is annoying -- it makes AT&T's phone less visually appealing than the other two. We understand that the eight and 13-megapixel modules have different thicknesses, but LG could have used a similar square pod to house both cameras and simplified its assembly process while maintaining a cohesive design across models. This inconsistency is annoying -- it makes AT&T's phone less visually appealing than the other two. Each device sports identical controls and ports: a standard 3.5mm headphone jack and secondary microphone on top; the power / lock key on the right; a micro-USB / MHL connector, primary microphone and two screws at the bottom; and the volume rocker on the left. While Sprint's Optimus G is devoid of any extra openings, the Korean version includes a micro-SIM tray on the left side below the volume rocker and AT&T's model puts a flap in the same location covering both micro-SIM and microSD card slots. Our Korean unit also rocks a retractable T-DMB antenna in the top-left corner for that extra bit of street cred. Beyond the wider body and lower resolution camera, AT&T's handset deviates further with a completely different edge design. Where the Sprint and Korean versions have mostly flat sides with two handsome silver rings -- one along the edge of the front glass and the other a quarter of the way down the side -- AT&T's model features curved edges with a dark chrome finish on the left and right along with textured flat sides at the top and bottom. As mentioned above, the notification light on AT&T's Optimus G is located around the power / lock key (instead of living next to the earpiece in front). By now you're probably wondering how that 4.7-inch True HD IPS PLUS panel stacks up to the competition. LG's Zerogap Touch technology puts the capacitive layer right inside the non-PenTile, 1,280 x 768-pixel screen for an ultra-thin design. It's definitely a top-notch display -- bright and crisp, with deep blacks and rich colors. Still, it falls short of HTC's gorgeous Super LCD 2 panel on the One X, which offers better viewing angles and remains the best screen on any phone we've ever used. Our Korean unit also suffers from a yellow discoloration at the bottom of the display -- it's mostly noticeable with a white background and we've alerted LG to the issue, which is likely the result of an early batch of defective panels. The Sprint and AT&T devices are flawless. It's definitely a top-notch display -- bright and crisp, with deep blacks and rich colors. Under the hood is where the Optimus G really shines. Reading the specs will put a smile on the face of even the most jaded tech journalist. It's the first handset built around Qualcomm's Fusion 3 chipset, which pairs a 1.5GHz quad-core Snapdragon S4 Pro SoC (APQ8064) with a 2G / 3G / LTE radio (MDM9615). Beyond the quad-core Krait CPU and Adreno 320 GPU, you'll find 2GB of DDR RAM and 32GB of built-in flash storage on board (reduced to 16GB on AT&T's unit, which also supports microSD and ships with a 16GB card). In terms of radios, the Korean version is quad-band GSM / GPRS (no EDGE), dual-band UMTS / HSPA+ (2100 / 900MHz) and LTE capable (Band 3, possibly 1 and 5). The Sprint model works on the carrier's CDMA and LTE technology in the US but should be able to roam on GSM / GPRS / EDGE (quadband) and UMTS / HSPA+ (dual-band 2100 / 900MHz) networks abroad. AT&T's phone supports quad-band GSM / GPRS / EDGE, tri-band UMTS / HSPA+ (2100 / 1900 / 850MHz) and LTE (Bands 4 and 17). Other specs include 802.11a/b/g/n, Bluetooth 4.0 + LE, A-GPS, NFC and a bevy of sensors (ambient light, proximity, magnetometer, accelerometer and orientation). Let's make one thing perfectly clear: the Optimus G is a performance beast. Let's make one thing perfectly clear: the Optimus G is a performance beast. Subjectively, it never skips a beat -- everything is snappy and fluid, with no lag or delays. Despite launching with Ice Cream Sandwich (Android 4.0.4, to be exact), it feels quicker than our Galaxy Nexus and on par with our Galaxy Note II, both running Jelly Bean. This is a testament to LG's UI optimizations, Qualcomm's engineering chops or both. In our benchmarks, the Optimus G slots right between our reigning champions -- the global Galaxy S III (ICS) and the Galaxy Note II (Jelly Bean) -- for most tests, while handily beating both with the best Quadrant score we've ever recorded for a handset (7,628) and barely lagging behind in AnTuTu (11,284). The results are similar across all three versions, with the Sprint model falling a smidgen behind the other two. It will be interesting to see how much these numbers improve once the Optimus G is updated to Android 4.1. Update: We've added results for Vellamo 2 HTML5 and GLBenchmark 2.5 Egypt HD C24Z16 Offscreen. We didn't have any issues with overall radio performance but calls sounded a little flat in our tests. AT&T's handset was the clearest, followed closely by Sprint's, with the Korean Optimus G (likely not optimized for US networks) trailing behind. The built-in speaker is somewhat tinny but loud enough. We didn't have much time to compare music playback with other phones, but audio quality with various headphones and earbuds was up to our higher-than-average standards. It's worth mentioning that LG's bundled music and video players feature Dolby Mobile, if you're into audio enhancement. Speed tests on AT&T's LTE network in San Francisco yielded about 12 Mbps down and 10 Mbps up (on average) with four out of five bars of signal. Until Sprint deploys LTE in the Bay Area we're stuck doing speed tests on CDMA, which means peaks of 2.3 Mbps down and 1 Mbps up with full signal. Our Korean unit only supports GPRS data here in the US, but we saw some impressive numbers with a prototype Optimus G on Korea's U+ LTE network while in Seoul. Battery life on Qualcomm's dual-core Snapdragon S4 devices is usually fantastic, and we're happy to report this trend continues with the quad-core Snapdragon S4 Pro-equipped Optimus G. While all three versions have the same sealed 2,100mAh Li-polymer battery, we focused our attention on AT&T's model since it's the only one with an active LTE connection. Our standard battery rundown test involves setting the brightness and volume to half, using 4G in a 75 percent or better signal area, enabling GPS and WiFi (not connected) and disabling Bluetooth while looping a video from a full charge until the battery is drained. AT&T's Optimus G ran for eight hours and 43 minutes; Sprint's lasted seven hours and 53 minutes on 3G (LTE off); and our Korean phone kept going for eight hours and 40 minutes on 2G (LTE and HSPA+ disabled). In our moderate battery usage test, which consists of using a handset lightly from a full charge until it shuts down -- emailing, texting, checking social networks, making a few brief calls, taking some pictures, etc. -- all three review units went on for almost 20 hours. As such, we're pretty sure most people will have no problems using the Optimus G for an entire day. Heavy users can use "Eco Mode," a setting which extends battery life by dynamically switching between quad- and dual-core operation. This is the story of promising shooters held back by a frustrating user experience. This is really a tale of two different cameras with identical functionality -- the story of promising shooters held back by a frustrating user experience. Both the Sprint and Korean versions of the Optimus G use a 13-megapixel, 1/3.2-inch BSI sensor with 1.1µm pixels and a five-element, f/2.4 autofocus lens. 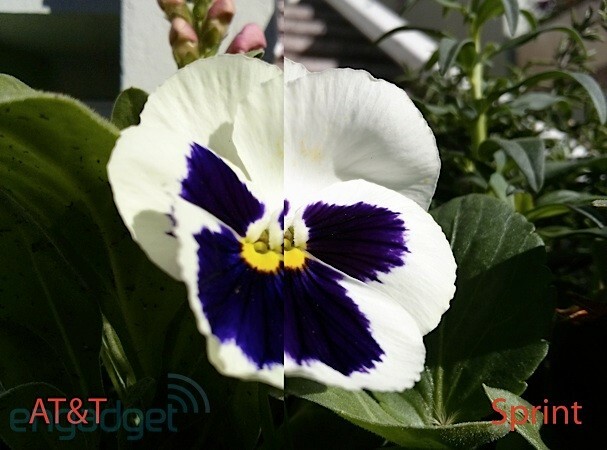 AT&T's model sports an 8-megapixel BSI sensor with identical 1.1µm pixels, but it's unclear if the autofocus lens is the same (the 13 MP module captures a wider field of view). Both cameras are capable of recording video at 1080p and are complemented by a single LED flash. The user interface is similar on all three phones -- it's intuitive, customizable and offers a full range of settings. You'll find HDR, panorama and burst modes, plus features like "Time Catch Shot" (which buffers pictures in the background and stores five images centered around the time when you press the shutter button) and "Cheese Shutter" (which takes a shot when you say the word "cheese" or "whiskey"). What makes both shooters problematic for casual users and photography buffs alike is the way the autofocus is implemented. It's continuous, but unlike competing systems, it re-triggers too often. There's no way to sidestep this -- no dedicated two-stage camera key, no ability to lock focus and exposure by tapping and holding the on-screen shutter button then releasing it to snap a picture. While touch-to-focus is available, it only locks focus and exposure momentarily before resuming continuous autofocus, which only gives you a brief window of opportunity to take that special shot. Other recent LG handsets like the Optimus 4X HD, Intuition and Escape suffer from the same problem, so hopefully the company is paying attention. It's an easy fix -- just add a setting to disable continuous autofocus. Now that we have that out of the way, how do these cameras fare? We're pretty satisfied with the resulting pictures, actually. Both shooters do a reasonably good job with white balance and exposure. We prefer the softer, more natural colors captured by the 13-megapixel camera -- the 8 MP sensor tends to produce overly warm and saturated colors. Low-light performance is generally excellent, but here again, the 13 MP shooter comes out ahead, with less visible noise. The 8-megapixel lens flares up a bit when shooting into bright light. Video recording is decent, if perhaps somewhat over-sharpened -- the Optimus G captures 1080p HD video at 30fps (10.5 Mbps bitrate) with continuous autofocus and mono audio. 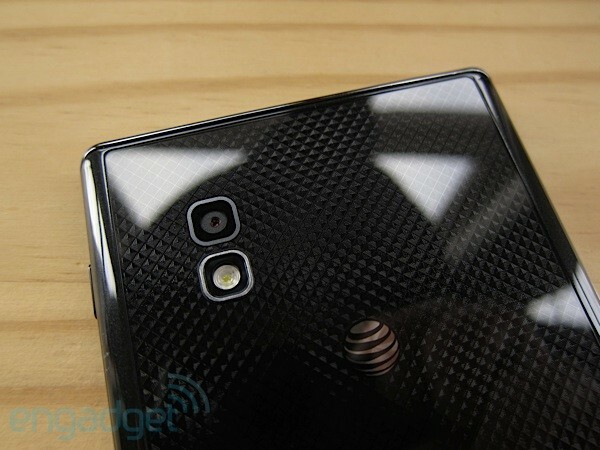 Overall, the 13-megapixel camera gathers tons of detail and edges out the One X and Galaxy S III. The 8 MP module slots right below the competition. UI 3.0 still looks dated and boring, like an nth-generation copy of Samsung's cartoonish TouchWiz interface. All three phones are running the manufacturer's now-familiar UI 3.0 skin on top of Android 4.0.4 (Ice Cream Sandwich). While it's somewhat disappointing that LG is launching the Optimus G without Jelly Bean, we're told this will be remedied soon. Of course, everyone knows the company's track record with software updates has been less than stellar. We shared our concerns with several executives during our recent trip to Seoul, who assured us that LG is aware of this and is committed to providing timely upgrades for the Optimus G. In other words, stay tuned. Unlike the handset's refined industrial design, UI 3.0 still looks dated and boring, like an nth-generation copy of Samsung's cartoonish TouchWiz interface. It's probably not going to offend anyone, but it's not particularly compelling either. At least it's lightweight, with little (if any) impact on performance. We've detailed UI 3.0 in other reviews before (Optimus L7, Optimus 4X HD and Intuition) but some of the existing features stand out. We're rather fond of the quick settings menu, a scrollable (and customizable) bar of icons at the top of the notification tray which provides shortcuts for various settings. Strangely, the hotspot quick settings icon is missing on AT&T's version (like on the LG Escape, it turns out). Perhaps it's an attempt by the carrier to discourage tethering? The app tray includes some welcome additions like folders and the ability to sort icons alphabetically or by installation date. "Icon Personalizer" lets you swap icons for any home screen app. "Quiet time" works like Apple's "Do Not Disturb" by defining times when notifications are muted. You'll also find a few Optimus G-specific tricks. "Wise Screen" is similar to Samsung's "Smart Stay" and prevents the phone from going to sleep when you're looking at the display. "Dual Screen Dual Play" lets you play back content on an external monitor connected via MHL or LG's Miracast dongle while you're performing other tasks on the device. "Live Zooming" enables pinch-to-zoom during video playback (up to 5x). Last but not least, "QSlide" overlays videos in a transparent window that floats over whatever app you're currently running -- it's really quite slick. The Optimus G comes with a bunch of pre-installed LG apps. Each model features a slightly different bundle, and while apps like SmartWorld (LG's app store) are self-explanatory, others are worth a closer look. QuickMemo is a lot like Samsung's S Memo -- it lets you annotate what's on the screen and save the result as an image. The app is invoked by pressing both volume keys simultaneously or by touching on the appropriate quick settings icon. LG Tag+ (called Olleh NFC on our Korean unit) is used to program the supplied NFC tags and set up profiles which are then activated by tapping the handset on the appropriate tag. Video Editor (oddly missing from AT&T's phone) and Video Wiz are, unsurprisingly, video editing apps, the former being similar to Apple's iMovie and the latter providing a quick way to create music videos by combining content from your music library with your own video clips. All three devices also include Polaris Office 4.0. Kudos to Sprint for keeping clutter to a minimum and bundling just two apps. Kudos to Sprint for keeping clutter to a minimum and bundling just two apps: Sprint ID and Sprint Zone. By contrast, AT&T makes a mess of the Optimus G by pre-loading 11 mostly useless apps that cannot be uninstalled: Amazon Kindle (useful, but readily available in the Play Store), AT&T Code Scanner, AT&T FamilyMap, AT&T Locker, AT&T Navigator, AT&T Ready2Go, AT&T Smart Wi-Fi, Device Help, Live TV, myAT&T and YPmobile. Adding insult to injury, AT&T chose to further customize LG's UI 3.0. The settings have been regrouped into tabs instead of using Android's standard sectioned list, the Gallery sorting order is set to descending by default (why?) and the default browser is contaminated with an utterly meaningless "browser bar" (which is thankfully defeatable). The Optimus G is a phenomenal piece of hardware that combines refined design, superb build quality and specs to die for. Qualcomm's quad-core Snapdragon S4 Pro provides gobs of performance without sacrificing battery life. While LG's 4.7-inch True HD IPS PLUS panel is beautiful, it still ranks behind HTC's gorgeous Super LCD 2 display on the One X. Despite that pesky continuous autofocus, both 13 and 8-megapixel cameras are capable of capturing top-notch photos and usable videos. Where the Optimus G falls short is in the software department -- LG's UI 3.0 skin is mediocre and Ice Cream Sandwich is somewhat disappointing on such a great handset. 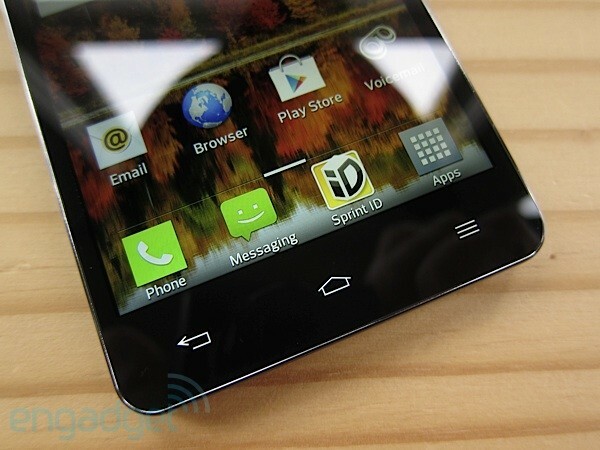 Apparently, there's an Optimus G-based Nexus phone running Jelly Bean in the works -- problem solved, then. The question remains: should you plunk down $200 (on contract) for Sprint's Optimus G when it goes on sale November 11th or AT&T's version when it hits the shelves on November 2nd? We prefer the simple and elegant design of the Sprint and Korean models -- not to mention the marginally better 13-megapixel shooter. Sprint's device is held back by poor LTE coverage and an embedded SIM. AT&T's unit suffers from excessive carrier tweaks (both hardware and software) and a slightly lower-grade 8 MP camera, but benefits from a mature LTE network and expandable storage. With AT&T about to offer HTC's One X+ and Samsung's Galaxy Note II, it's a tough call. So, did we mention that upcoming Nexus?